SAH KD-tree acceleration data structure for fast ray-triangle intersections. Implements the construction algorithm for 'perfect split' trees as outlined in the paper "On Bulding fast kd-Trees for Ray Tracing, and on doing that in O(N log N)" by Ingo Wald and Vlastimil Havran. Non-triangle shapes are supported, but most optimizations here target large triangle meshes. For more details regarding the construction algorithm, please refer to the class GenericKDTree. This class offers a choice of two different triangle intersection algorithms: By default, intersections are computed using the "TriAccel" projection with pre-computation method from Ingo Wald's PhD thesis "Realtime Ray Tracing and Interactive Global Illumination". This adds an overhead of 48 bytes per triangle. When compiled with MTS_KD_CONSERVE_MEMORY, the Moeller-Trumbore intersection test is used instead, which doesn't need any extra storage. However, it also tends to be quite a bit slower. Add a shape to the kd-tree. Return the shape index corresponding to a primitive index seen by the generic kd-tree implementation. When this is a triangle mesh, the idx parameter is updated to the triangle index within the mesh. Return an axis-aligned bounding box containing all primitives. Return the axis-aligned bounding box of a certain primitive. 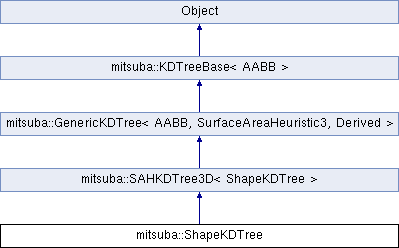 Reimplemented from mitsuba::KDTreeBase< AABB >. Return the AABB of a primitive when clipped to another AABB. Return the list of stored shapes. Check whether a primitive is intersected by the given ray. Some temporary space is supplied to store data that can later be used to create a detailed intersection record. Check whether a primitive is intersected by the given ray. This version is used for shadow rays, hence no temporary space is supplied. Intersect a ray against all primitives stored in the kd-tree and return detailed intersection information. Intersect a ray against all primitives stored in the kd-tree and return the traveled distance and intersected shape. This function represents a performance compromise when the intersected shape must be known, but there is no need for a detailed intersection record. uv The UV coordinates associated with the intersection will be stored here. Test a ray for occlusion with respect to all primitives stored in the kd-tree. This function does not compute a detailed intersection record, and it never determines the closest intersection, which makes it quite a bit faster than the other two rayIntersect() methods. However, for this reason, it can only be used to check whether there is any occlusion along a ray or ray segment.